No. 13 & 15, Jalan Utama 2/20, Taman Perindustrian Puchong Utama, 47140 Puchong, Selangor, Malaysia. Established in 1993, Hup Yeng Engineering Works excels in machanical works more than ten years. Begin from year 2000, we are in specially designed and fabricated all kinds of custom made light packaging machine to meet the different needs of packaging industries. We have been researching and developing all kinds of customized labelling machine since year 2003. we’ve fabricated & manufactured labeling machine such as Top Labelling 3 in 1; Economy Side Labelling; Attachman top Labelling; Economy desktop Laballing and etc. We also work together with our strategic business partner, Yew Hup Engineering(formerly known as wing hup engrg. works) to provide good services to our machining spare parts. 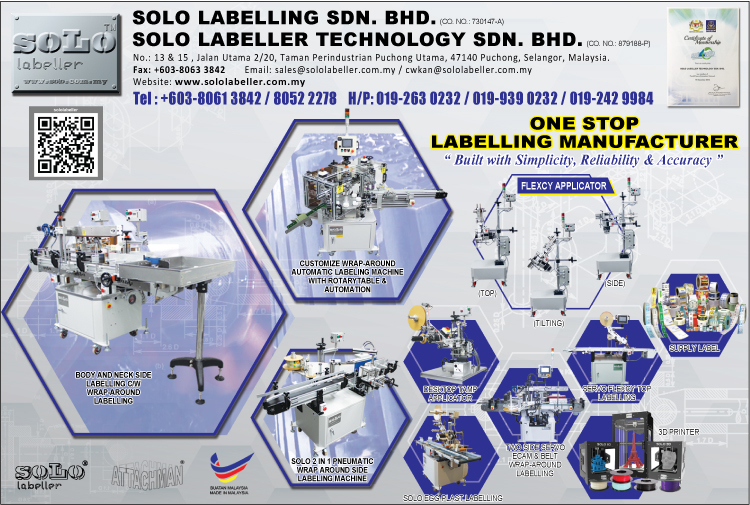 and Solo Labelling Sdn Bhd (a subsidiary of Hup Yeng) focus marketing for oversea.